Inspect apple and pear trees, and flag dead fire blight twigs and limbs to easily find them for winter pruning. Prevent new coryneum blight (shothole) infections this fall by applying copper to trees when 50% of the leaves have fallen. Use enough pressure to blow off remaining leaves. Record your pest management successes or failures and plan to adjust for next year. 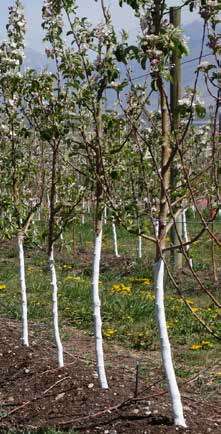 Make sure all new plantings get white paint (50% latex/50% water) or white tree wrap from the base of the tree to scaffold limbs, to prevent sunscald. Clean up all fallen fruit and remove weeds or tall grass from around the base of trees. Irrigate before the ground freezes. 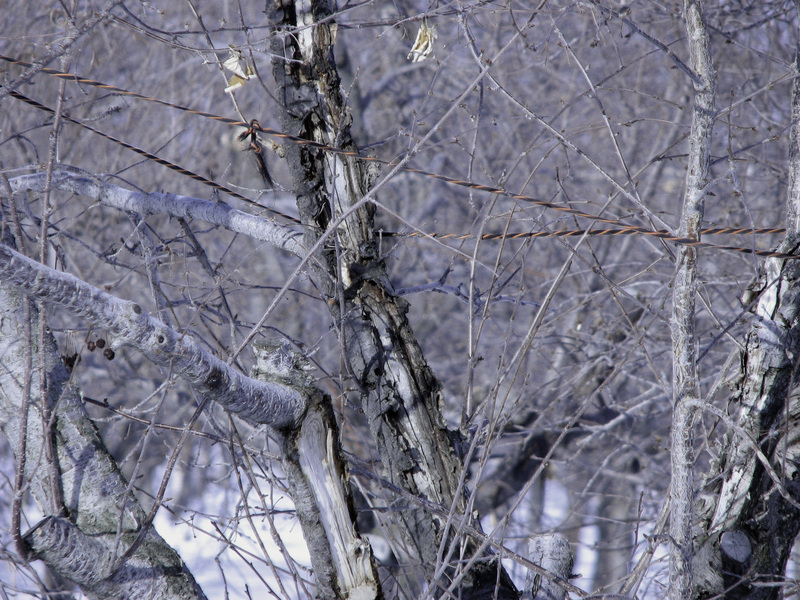 To identify fire blight in winter, look for twigs where the leaves remain attached. 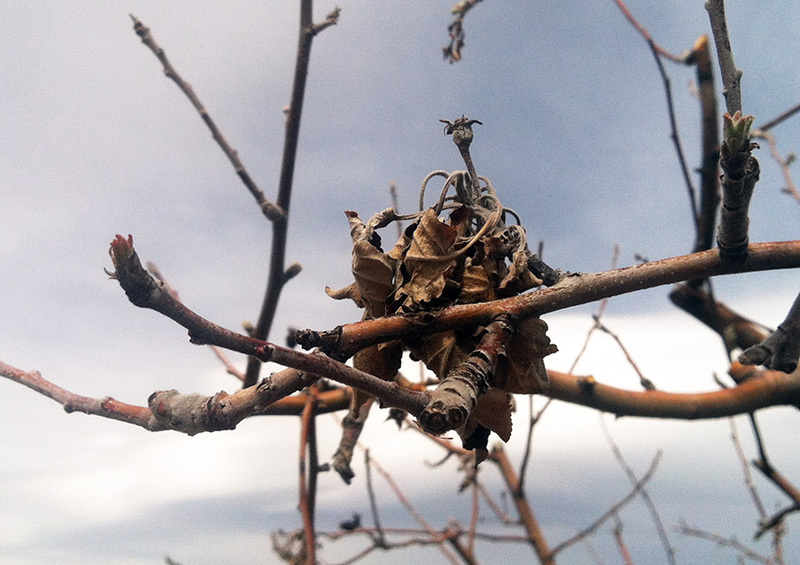 This fall, inspect trees and orchards for fire blight cankers. They are easy to spot because the leaves remain attached to the dead shoots. Flag the limbs so they are easy to find later, and prune them out when you conduct your normal late winter pruning. If there are crabapples, hawthorn, or ornamental pear nearby, inspect and flag branches on those trees as well, and plan to prune them at the same time. When pruning fire blight on dormant trees, it is not necessary to sterilize pruners between cuts. Remove the affected shoots and branches by cutting 10-12 inches below the visible symptoms. If you are diligent about removing as much fire blight as possible, you are lessening the chances of an outbreak next season. 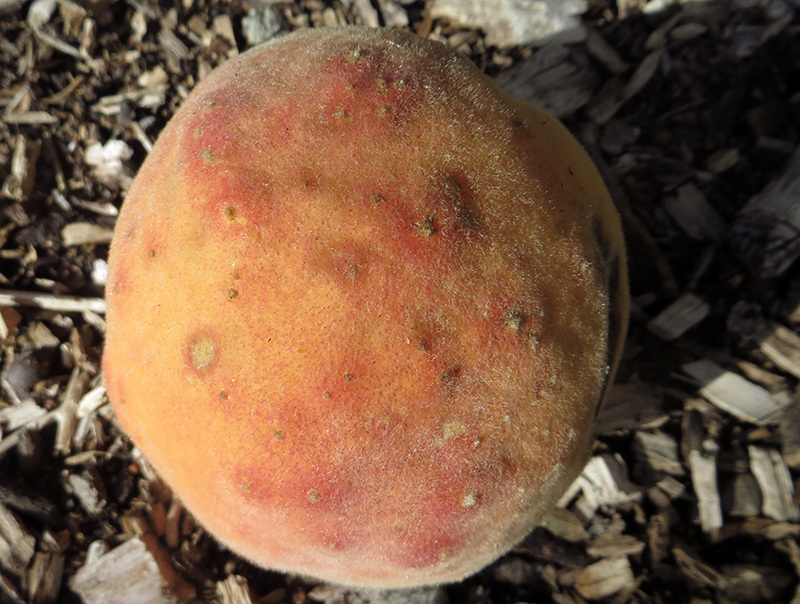 This peach has infections that happened early in the season (tan and scabby) and late in the season (round and sunken). The reason to wait for 50% leaf drop is because cornyeum spores infect twigs through the new leaf scars in fall. So the fungicide spray should coat the tree so that the leaf scars are protected. If any orchards or trees have severe infections, it will take at least three years of diligent fall, spring, and summer treatments to suppress the disease incidence. Keeping computer records of pest management is just as important as financial records. For commercial applicators, it is the law, but aside from that, records allow any grower to refer to past years to see what worked and what didn’t, and if any pests are becoming more or less of a problem over time. Penn State University offers a comprehensive Excel spreadsheet for commercial applicators to record pesticides. The Fruit PestFinder app can help identify pests while scouting. Regarding pests, if you are reading this advisory, then you should be inspecting your own fruit trees at least every other week throughout the season. For each inspection, record the date, location, pests found and at what level, and plant health (symptoms found). A very important inspection time is at harvest, where you should record all types of fruit damage, and the percent of fruit affected. 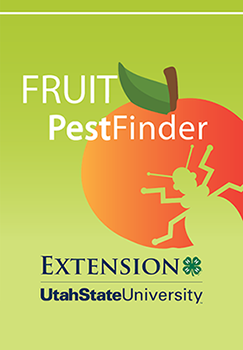 The Fruit PestFinder is a great app to help identify pests and look up management practices. So if you have been diligent about recording pesticides and pest activity, then you can compare the pests and damage you found on your trees and fruit during the season against any spray applications you made. Record your conclusions to determine if products worked, or if you over-sprayed or under-sprayed so that you can make adjustments next season. Keep roots moist: At this time of year, leaves on trees are changing color and dropping, while underground, major root growth is occurring. So it is important to maintain adequate but not excessive soil moisture from now until the soil freezes for winter. Do not fertilize now: Roots will continue to grow all through fall, but nutrient uptake essentially ceases after the leaves have dropped. It is too late for any fall fertilizer applications, as whatever is applied will leach out of the soil. Prevent winter sunscald: In late winter, bark can be warmed by intense sunlight. 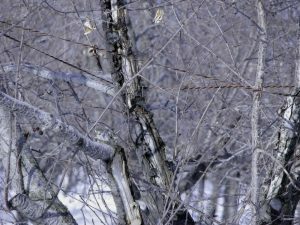 If this warming is followed by a cold spell that night, the bark can be killed. Sunscald is one of the primary problems affecting young trees in Utah and is a major factor in the incidence of cytospora canker or flatheaded borers. Protect trunks by applying white tree wrap or painting the trunk and lower scaffold limbs with a 1:1 mixture of white latex paint to water. If using tree wrap, remove it in early April. Tree removal: Trees suffering from significant insect, disease, or other problems should be removed now. There is still time to install replacement plantings this fall. Protect from mice, voles: Create or maintain at least 3 feet of clear space from around the base of each tree to help minimize rodents from feeding on bark and roots. 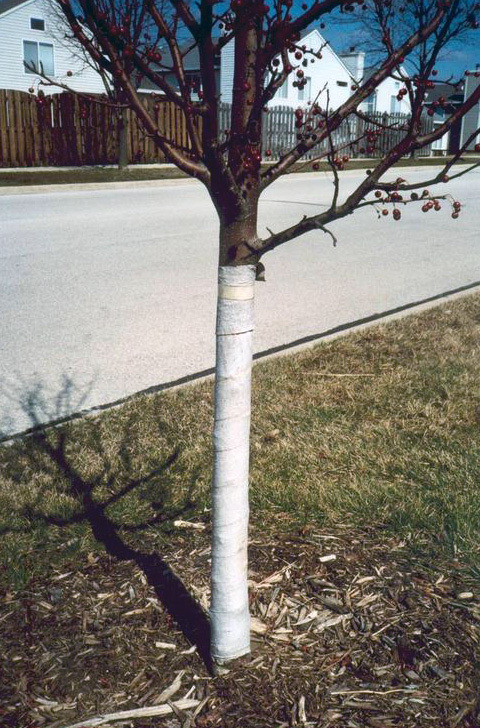 Young trees are particularly susceptible to girdling because their trunk circumference is so small. Consider installing a physical barrier around the trunk and down into the soil up to 6 inches. The upper scaffold limbs of this peach tree were affected by sunscald many years ago. This type of injury often is not apparent until a few years late. It can serve as an entry for canker-causing diseases.